Atlantic City is located 127 miles southwest of Manhattan in Southern New Jersey. 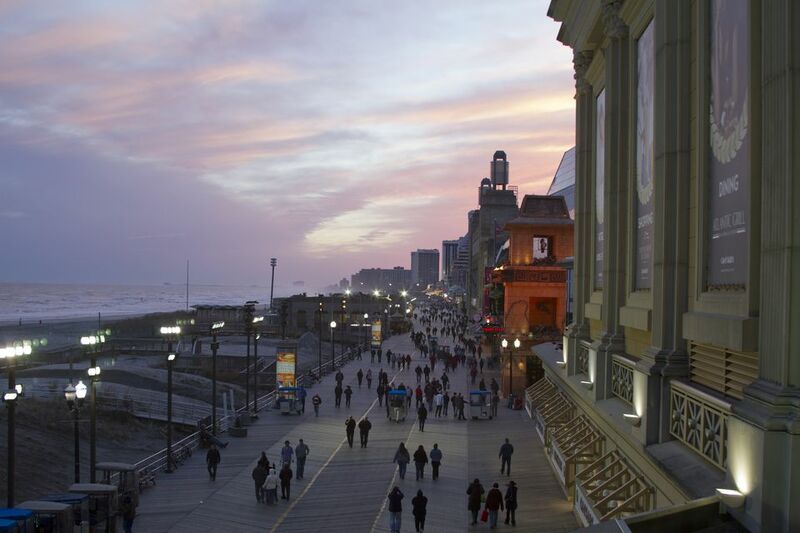 Atlantic City is a popular day trip from New York City. If you are visiting the East Coast and want to get a taste of the Atlantic City casinos, outlet shops, and sandy beach, consider spending a day visiting this popular South Jersey destination. To travel from New York City to Atlantic City, NJ there are several options, many of which will be cheaper if booked in advance. Bus service from New York City to Atlantic City is an easy, affordable option for visitors. Trips take about two-and-a-half to three hours but can be longer depending on traffic. Greyhound's "Lucky Streak" service departs from within Port Authority Bus Terminal and offers drop-off at a number of different Atlantic City casinos in addition to the Atlantic City bus station. If you disembark at a casino, round-trip riders often get a "free play" voucher to use at the casino. Return tickets are open-ended and can be used to get back to NYC when you like rather than on a specific bus. Although the bus ride down is often full of upbeat Atlantic City-bound travelers, the ride home can be a bit of a circus with a cast of downtrodden folks who might have lost too much at the casino. Driving from New York City to Atlantic City is pretty easy and straightforward. The route is fairly direct along the Garden State Parkway and parking is easy and affordable in Atlantic City. Plan on a minimum of three hours of travel time, though stops and traffic (which is particularly heavy during beach season) will add to the overall time. You can rent cars in Manhattan, though rates at the airport tend to be cheaper. If you've got money to spend and no time to waste, you can charter a helicopter to take you to Atlantic City. Travel time from Manhattan to Atlantic City is about 45 minutes and charter flights cost thousands of dollars and can accommodate six passengers. Liberty Helicopters, HeliNY, and New York Helicopters are some of the NYC-area companies offering helicopter charters. This one is a great option if you're traveling with a group and don't want to deal with the hassle of renting a car and driving (and can't afford a helicopter!) Just about all New York City car services can accommodate this request, whether you want someone to drive you down and wait a few hours or you want to stay a night or more. Prices will vary depending on the number of passengers and your plans. Traveling to Atlantic City from New York City by train isn't as easy as it should be. You'll need to travel to Philadelphia and transfer to the New Jersey Transit service to Atlantic City (direct train service between NYC and Atlantic City on the ACES Train has been discontinued). This will then leave you at the Atlantic City train station, which is about half a mile from the Boardwalk. Amtrak and New Jersey Transit trains travel from Penn Station in Manhattan to 30th Street Station (direct on Amtrak; via Trenton on NJ Transit.) Train travel takes at least 3 hours and 45 minutes but can take longer depending on schedules. You can purchase tickets in advance on Amtrak's website or in person at Penn Station.